So check me out, another review in the same week! 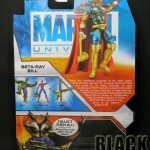 Here we have one of the most distinct and obscure heroes of the Marvel Universe. Bill was picked to be the champion of his alien race, the Korbinites, to fight their enemies and find them a new home. 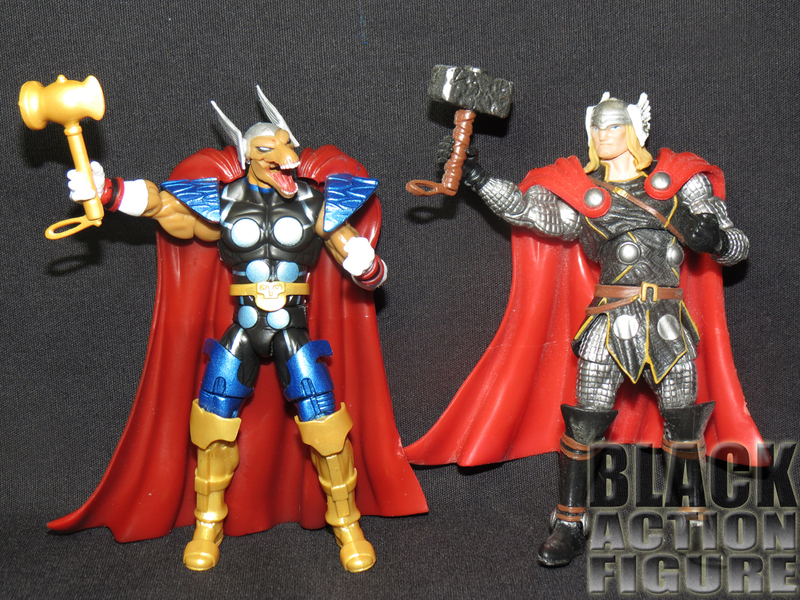 During his travels, he ran across Thor and the two fought. During the fight, Bill was able to successfully wield Thor’s hammer, Mjolnir. When he wielded it, he gained the powers and appearance of Thor. 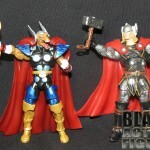 After the gratuitous fight and everyone became friends again, Bill gave Mjolnir back to Thor, but Odin granted him a similarly powered weapon named Stormbreaker. 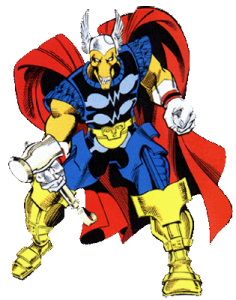 With Stormbreaker, Beta-Ray Bill retained the powers of Thor and fought for his people the Korbinites as well as the Asgardians. 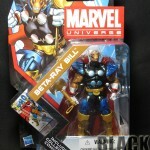 Beta-Ray Bill has already been immortalized several times in the Toy Biz line. 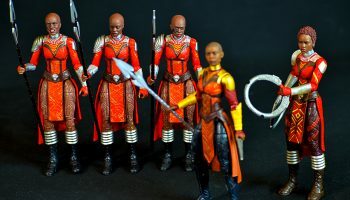 I believe this is Hasbro’s first attempt at the character and I couldn’t wait to review it (even though I reviewed Beast first). 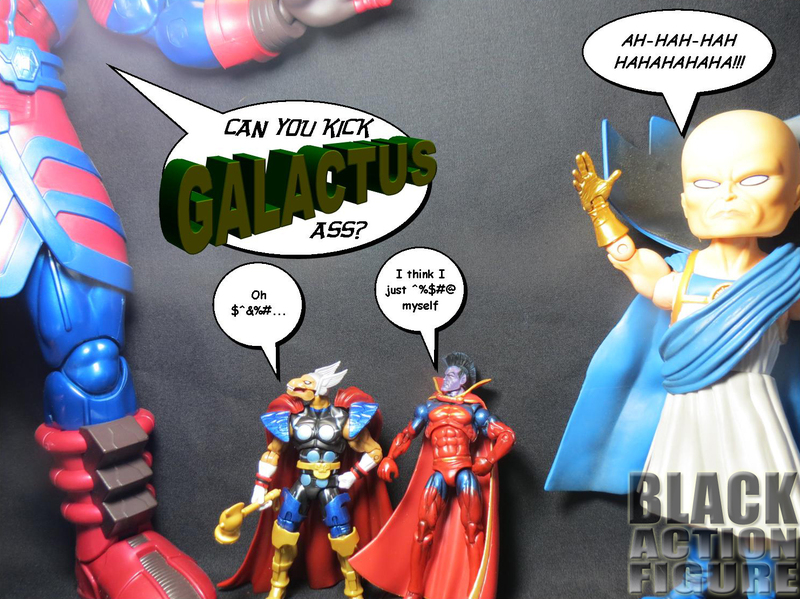 Check out how great this figure turned out after the break. Just like the Beast review, Hasbro continues to impress me with their packaging. I have found that while in the store, I would often pick up a figure I already own just to look at the packaging. I can understand how the “mint-in-package” collectors feel, because this one looks spectacular. 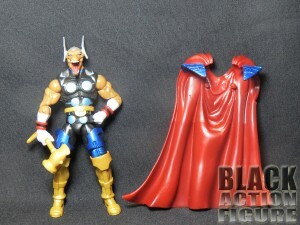 The front boldly displays the action figure in a solid upright stance (no upside-down for this character, sorry Beast). The artwork on the card definitely does this figure justice as the figure looks like the artwork just jumped off the page. 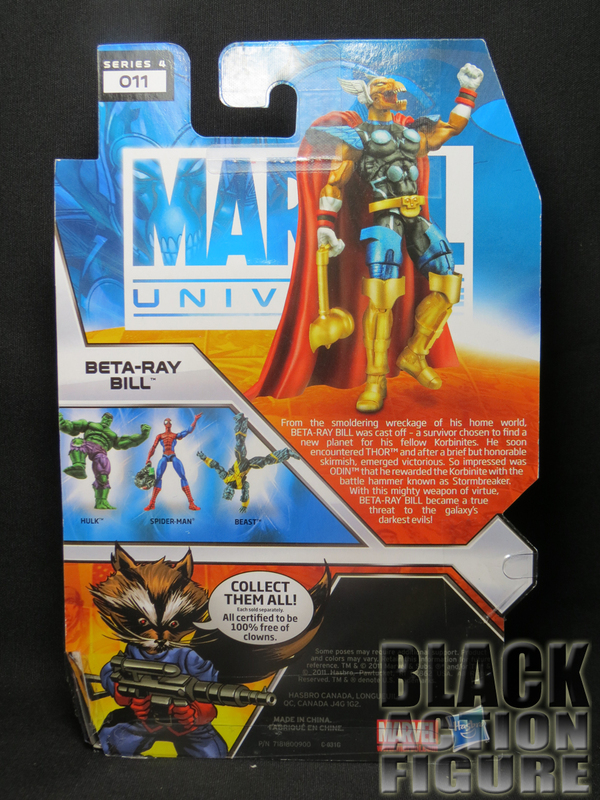 On the back, you get to see the posed figure along with other figures in the line including a new-sculpt Hulk, Ultimate Spider-Man and Beast. 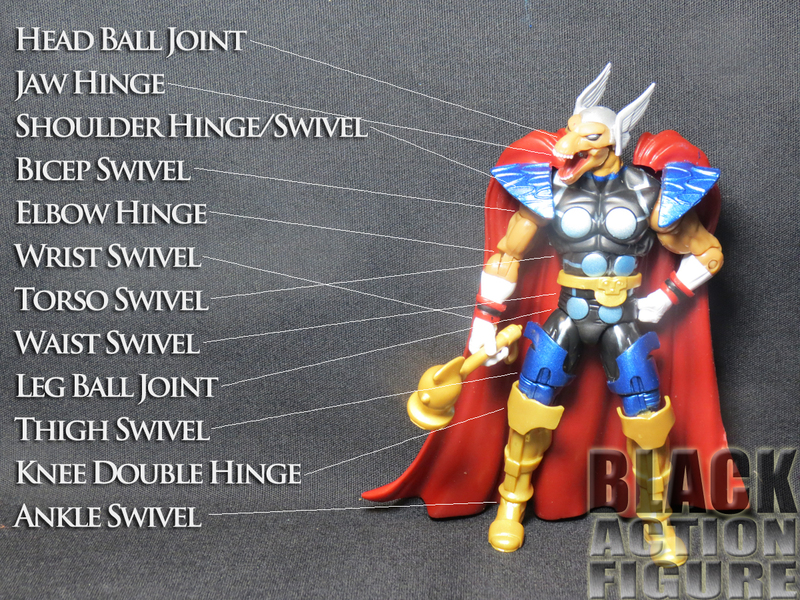 You also get a quick summary of Beta-Ray Bill’s origin. And again, we have Rocket Raccoon talking crap at the bottom: “All certified to be 100% free of clowns.” I can’t help but think that this is a dig at DC and their love of all things Joker (including Harley Quinn). This section is not rocket science. Beta-Ray Bill comes with his hammer, Stormbringer. 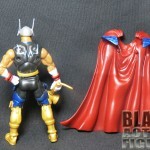 If you really want to be picky, he also comes with a detachable cape (with built in shoulder pads). 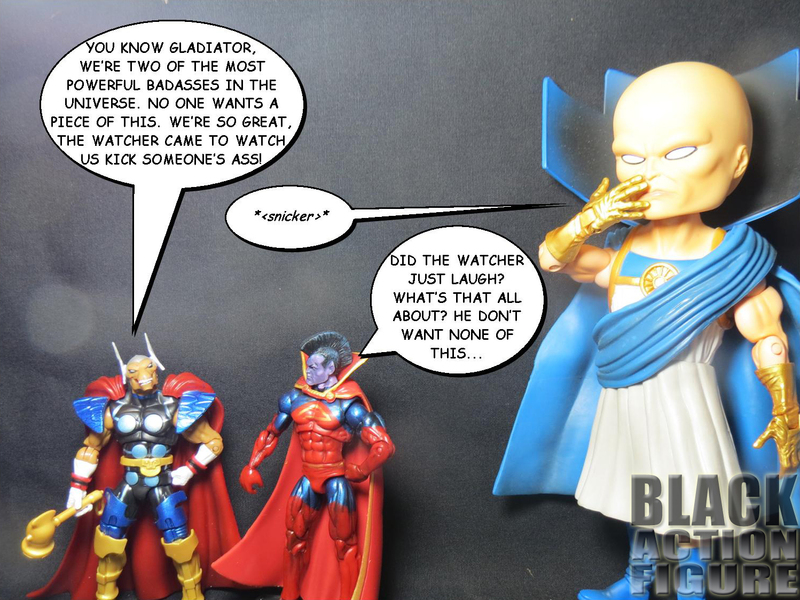 As always, Hasbro has missed a golden opportunity to include a freakin’ stand. If we as collectors make ourselves heard, maybe the stand will see a comeback down the line. Otherwise, we have to hold down the fort and settle for buying our own aftermarket stands. 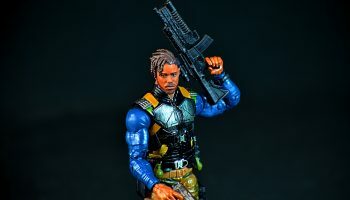 Just off the top, I have to say that Hasbro did a damn good job on replicating this comic book character. The paint application is great and the design of Bill’s costume is comic book accurate. 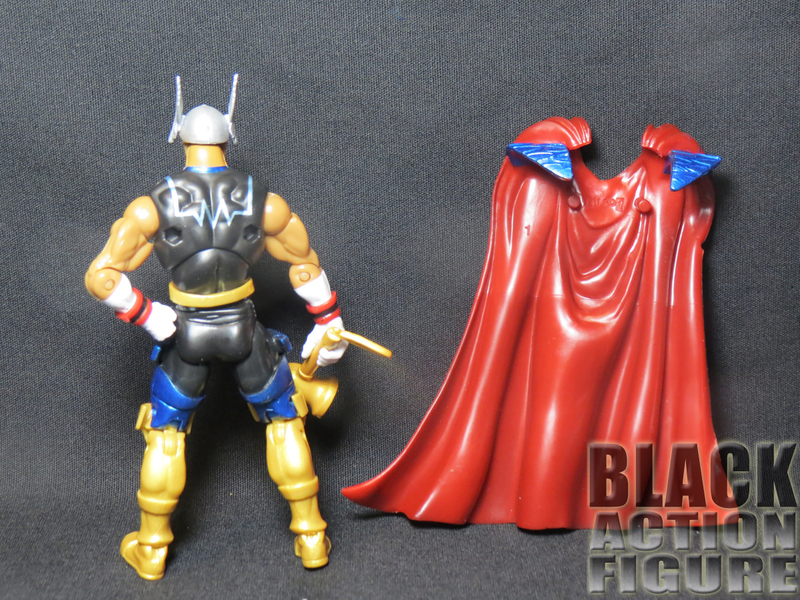 I was even impressed with the back of his costume which even though it is mostly covered up by the included cape, was still completed so Bill looks great with or without the cape. 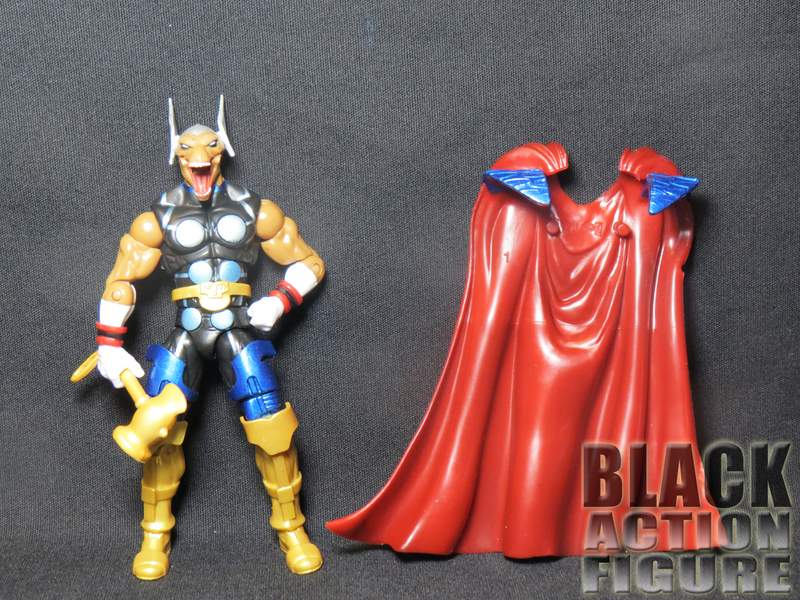 The weird thing about the design of this figure is that the shoulder pads are connected to his cape, so when you take off the cape, the shoulder pads come with it. 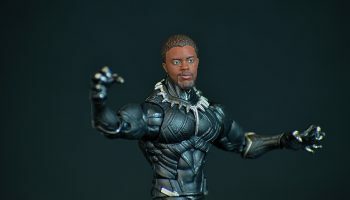 While I at first was against this, I figured out that this allowed the figure to move more freely and it doesn’t take away from his look when his cape is off. The boots are sculpted well and his thigh armor is striking with the metallic blue paint application. A top notch effort for Hasbro and their designers. A weird request from me…I wish they switched his open hand with his closed hand. 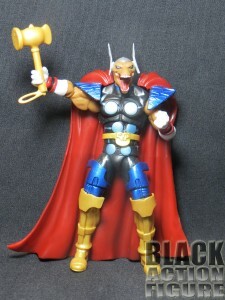 Just to be a little nitpicky, but I wish it was opposite of the Thor figure, and moreso for personal reasons than anything that was done incorrectly. This figure has over 24 points of articulation, another impressive effort by Hasbro. But there are some issues. Like Beast, Bill has a hard time of moving his head up and down on the ball joint due to the sculpt of his head. Also, while he has full range of motion while the cape is off, the cape with the shoulder pads does hamper that range of motion. Now the good…let’s just say everything else! Unlike Beast, Bill has waist articulation. 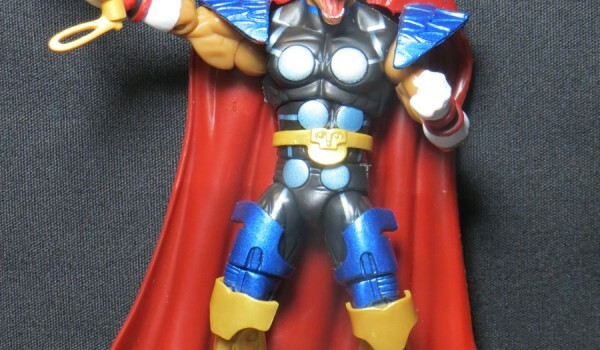 I also like how his double-hinged knee articulation is perfectly disguised with the top of his boots. And for one of the first times that I can think of, we have a figure with jaw articulation in this line…he can open and close his mouth! Be careful how often you do it though, because it is not all the way secured and it can drop off and be lost fairly easy (which happened to me for a good five minutes). A wonderful effort by Hasbro! I hope they keep pushing out quality like this. One thing I would like though is if they could tighten some of the joints so they don’t get so loose so quick. Collectors know of tricks to tighten them up, but the common kid could roll through this figure and possibly break him within a week. 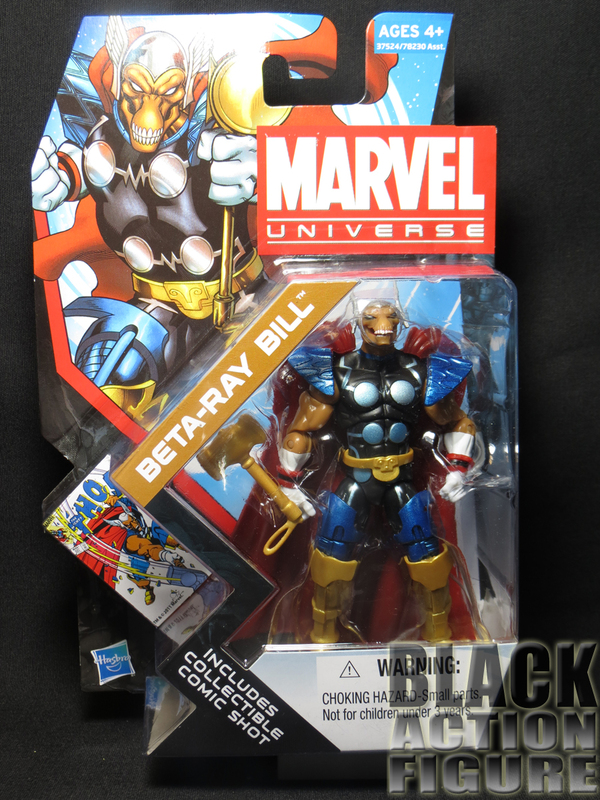 One thing I noticed and will mention in the “Should You Buy” section – a lot of new characters have been showing up in the “Avengers: Earth’s Mightiest Heroes” animated series…including an episode dedicated to Beta-Ray Bill. It seems that someone at Marvel or Hasbro knows in order to sell product, you must “advertise”, and the best advertisement (as Hasbro well knows) is a cartoon linked to the product. Well played Hasbro, well played. 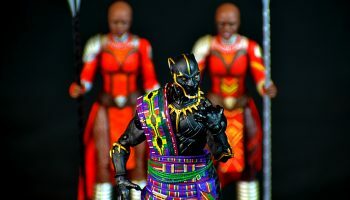 This and most figures featured in this review are now available in the BlackActionFigure.com Store! Kids Normally, I would have said no because let’s face it, do you really know who he is? I mean, he looks cool, but would that truly satisfy your kiddy wants? But since his episode aired on Avengers: Earth’s Mightiest Heroes, you’ll probably be begging your parents for one. Go for it! Parents Despite his looks parents, he’s one of the good ones. A great lesson to teach your kids…don’t judge an alien by his horse-like head. Collectors Great sculpting, great articulation, what more can you want, fanboy? Although honestly, if you’re anything like me, you already have the figure. But if not, head to the store right away!